VAN WERT — The Van Wert County Regional Airport Authority is charged with overseeing the Van Wert County Airport and its day-to-day operation. The seven-member volunteer authority guides the development and growth of the airport primarily through personnel management and capital improvement planning. 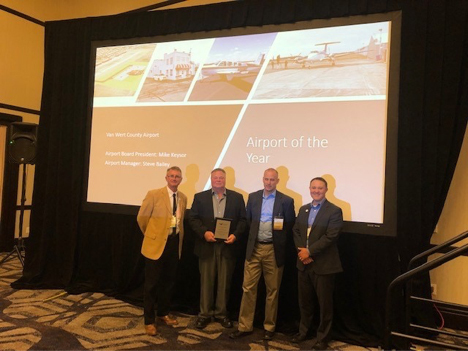 The airport has recently become more pro-active and aggressive in creating an airport that is not only inviting to General Aviation traffic but striving to provide the needs of the corporate traveler and become the front door to the community and represent the northwest Ohio area. The last three years at the Van Wert County Airport have seen a change in direction and attitude as the Airport Authority has identified a 10-year plan to transform the airport into the economic generator it can be. A look back at the previous 20-year period shows the airport was primarily in a maintain status rather than growth. Like most General Aviation airports, funding is often the roadblock to transformation, and this was true for Van Wert as well. Seeing a struggle just to match FAA grants, and upcoming projects like a new terminal building that don’t compete well for grants, the Authority got creative. A capital fundraising campaign was prepared with a goal to raise in excess of $1 million dollars. This would provide 10-years of FAA grant matching funds, but even more importantly allow for a new terminal building to be constructed replacing the 75+ year old current structure. Other funding needs included hangar upgrades and equipment.